Offering you a complete choice of products which include shoulder cords and shoulder patches. 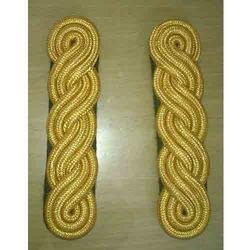 We are manufacturers, exporter and suppliers of a qualitative range of Shoulder Cords. We employ best quality raw materials to fabricate these cords and ensure durability and reliability of our products. Following the exact demands of our clients, we provide these Cords in various designs, styles, lengths, thicknesses and other specifications. Customers can avail our products at market leading rates. Looking for Shoulder Cords ?